As a longtime Taylor Swift fan who's spent far too much time over the last several years defending her choices and love life from the ~haters~ that abound, I can't say I didn't let out a huge sigh of relief upon learning that she had seemingly found real love. From their sweet-sounding dates to their adventures in the snow, Swift and Calvin Harris have become one of the cutest celeb couples around, and it makes me truly happy to see them so happy together. Especially when it comes to their time spent at events — seriously, there is nothing better than a Taylor Swift and Calvin Harris awards show appearance. It hasn't happened often, as the two tend not to be spotted in public together when they can help it, but when it has, it's been nothing short of adorable. While at awards shows together, sitting side by side, Swift and Harris show nothing but support for one another, cheering each other on and generally seeming to have a fantastic time. So in honor of their expected appearances at the 2016 Grammys, let's take a look back at the cutest Swift-Harris awards show appearances yet. PDA isn't common for these two, but it looks like hanging out at the Billboard Awards counted as an exception. Watch the video here. But not until she celebrated with her squad. Ladies first! 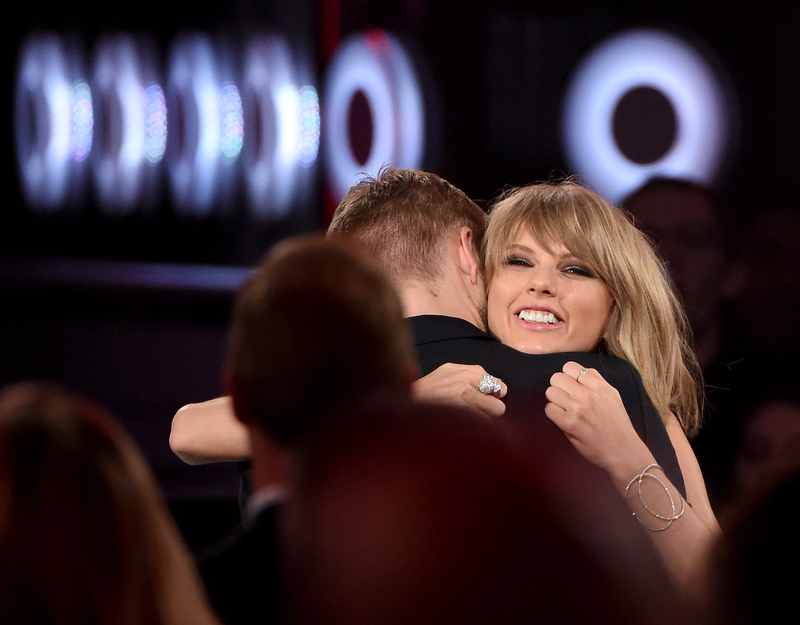 Another sweet Billboard Awards moment, while celebrating yet another T.Swift win. Even 10-feet-tall blonde supermodels can have awkward moments. OK, it wasn't at the actual awards show, but at Taylor's brother's college graduation party that happened the same night as the Billboard Awards, Swift and Harris didn't shy away from showing some affection. The duo haven't had too many awards show moments together, unfortunately, but hopefully that'll change this year. Swift is opening the Grammys and is nominated for several prizes, so she'll definitely be in attendance, and Harris could very well join her for support. Here's hoping that leads to many more cute moments between the two for fans to replay over and over.